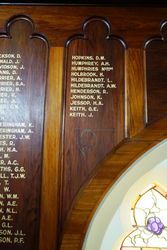 The Honour Roll commemorates those connected with the church who served in World War One. 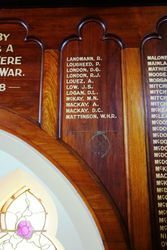 The roll was unveiled at the same time as the memorial window which is listed as a separate entry. 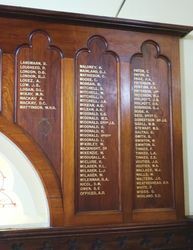 The names of those who lost their lives are listed on the memorial pulpit which was a gift from the parents as part of the restoration of the church. Warrnambool. 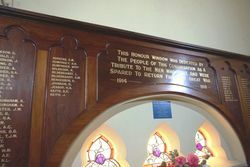 The soldiers' memorial window and honor board at St. John's Presbyterian Church was unveiled on Sunday afternoon in the presence of a crowded congregation by Rev. 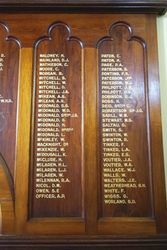 M. M'Queen, of Noorat, late chaplain in the A.I.F. 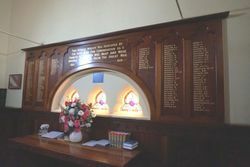 The window and board are very handsome features of the church, the restoration of which, after the fire of two years ago, is now complete. The main portion of the window represents the Transfiguration, and the two outer panels represent Gabriel and St. Michael. 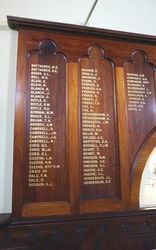 The honor board is designed in seven Gothic blackwood panels, and contains about 130 names. Age (Melbourne), 29 August 1922. 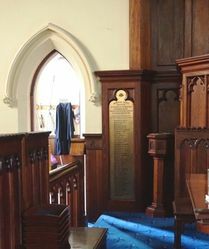 Note: The pulpit of the church was a gift from the parents as part of the restoration of the church which had been destroyed by fire. The pulpit and other gifts and furnishings were dedicated on the re-opening of the church on the 19th August 1922.